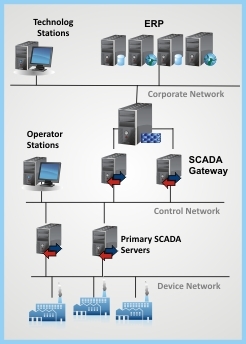 Info Control SCADA is a modern and highly reliable multifunctional software product. Together with the programmable INFO and microINFO series logic controllers, IBUS industrial network and other INFO software packages represent the foundation for the implementation of the system for Supervisory, Control and Data Acquisition in a variety of processes. Info Control SCADA has been developed based on a thirty years of experience of our experts, accumulated in the field of automation of technological processes, as well as in the field of system integration (SI). Thanks to that experience and to understanding of modern software tools and solutions, the final product is tailored to fit the needs of even the most demanding users. Info Control SCADA is a software package for real-time operations, developed in the service architecture, fully compatible with the dominant standards of OPC specifications. This package enables processing of a large number of data in a short time intervals - more than 100,000 updates per second – which makes it one of the highest quality SCADA packages. Info Control SCADA has a high degree of scalability, because it can be applied in the small systems, which have all the system components located in a single computer, as well as visualization and management of large systems, where the server part is allocated to separate workstations, while the client computers for visualization and user interface are connected to the server using Ethernet. ability to upgrade the system without changing the configuration. As with other SCADA products, the licensing system has to variants: the package may be a developmental or run-time, depending on the amount of points. Part of the package for creating graphics is free, so that the user can start making their own project, without the cost of a package. InfoGraph Editor is a part of the SCADA package used to display the layout of the technological process (i.e. 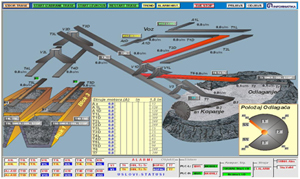 visualization) for the needs of operating and engineering stations, while connecting users with the process in real time. Within InfoGraph Editora there is a library of simple technological objects and frequently used symbols (lines, figures, pipes, tanks, pumps, etc.). Of course, all subsequently created objects and symbols are saved in the existing library and can be used in other projects. Specific dynamic functions (movement, rotation, change of dimension, change of color, dynamically shading, etc.) can be set for each object. As these functions are dependent on a technological parameters of the process, changing these parameters changes these functions. This enables a highly realistic representation of the actual state of the process. Working with the editor is interactive. Process interfaces defined in InfoGraph Editor are activated in InfoView component. Real-Time Data Server is a universal server application for data acquisition and processing the data from industrial processes. archiving the history of the process and its subsequent reading. Server allows vertical cascading binding for transmission of data in the "upper" layers of information system, as well as the horizontal connection to achieve redundancy at the SCADA system level. Reports made using the functional components of Info Control SCADA package can be printed or accessed on the web. Generating PDF files is also supported. History log componet requires SQL Server 2000 or later (MSDE 2000 SP3 is included in SCADA system installation - Microsoft Database Engine - for small projects, i.e. for the needs of projects that do not require a large amount of resources). Info Control SCADA package has a built-in redundancy - Info Redundancy Component. This enables to set up a redundant system with two parallel servers, where one of them is primary for each client, and the other one is secondary. In case of primary server downtime, the system automatically switches to the secondary server. After the recovery of the primary server, the client is returned to it. Alarms are a special segment of Info Control SCADA package - warning statements about events that are not in accordance with the given technological parameters. Alarms are displayed to the operator in the form of a specially created windows or by using an animated object graphics - in this case the color of the object is changed - and there is a possibility for activating sound alarms. Alarm information is displayed automatically, and the operators can also see it at their own request. Alarm information includes the exact time of its appearance, and the time of its cancelation. Info Control SCADA allows creating alarm, which is important in cases of subsequent analysis of events and determining the order of alarm occurrences. Info Control SCADA enables realization of the so-called diagnostic alarms, which are important for equipment maintenance service, since they enable screen warnings about the deadline for replacement of a specific parts, deadline for part lubrication or a reminder for some other action related to maintenance, as well as warnings regarding the fact that some part stopped working and must be replaced. 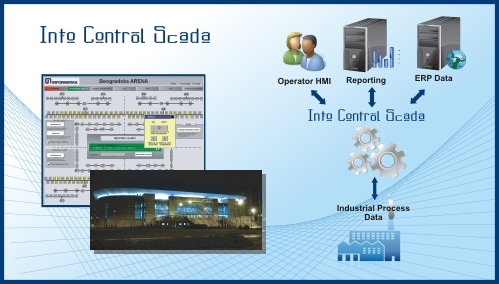 Info Control SCADA system features a simple system for trends displaying. Using the appropriate package functions user is able to create a variety of diagrams for monitoring the appropriate process parameters in real time, and subsequently for the selected time period. This function of SCADA package represents the software implemented required number of " loggers" that register real events in the process. A special and highly important part of SCADA package represents Report Server, which creates various reports. This functional part of the SCADA package is particularly important for senior management, which can, timely and in the desired form, obtain reports regarding the events from the process, important for monitoring and decision making. Info Control SCADA provides easy access to data, both from the local intranet, and the Internet. Web service interface provides easy connection to SCADA system with the .NET framework. The system can be expanded by using the Internet Information Server (IIS). Values from SCADA systems are available via the Web service, and certain screens from the local clients can be exported directly in a web page on a server. Data Server can establish a fast connection with the database for execution of SQL commands, with the process values as parameters, and can also write scripts that can be accessed and write data from the process anywhere. Info Control SCADA package can be easily linked with other software packages made in accordance with the latest information technologies, using ADO.NET provider to read the history of the processes and alarms history. This provides the basic ability to connect business software with the industrial work, which is the first step towards an integrated business-manufacturing information system, which uses live data from the process and introduces them in accounting and other company workflows as well as for the use of software as a help in the decision-making process. Call us today to learn more how we can help your organization automate essential processes and make them better, faster and more competitive.